If I were able to disregard certain artists just by looking at their record label, it would save me a lot of time. I should explain. While you typically have your huge record labels - Universal, Warner, and Sony - you also have your smaller labels that are dedicated to putting out a specific style and format of music, and can sometimes even be headed up by the lead artist on the label, or were even founded by said artist (Dr. Dre in the case of Aftermath, for example). And with this rough categorization and the knowledge that certain producers work across multiple artists on the same label, you can detect trends that crop up in the music of artists signed to these labels, and if you dislike those trends, you have an easy target to blame. And recently, the label Cherrytree Records has come up in my line of fire more than once. This is the record label who put out LMFAO and the Far East Movement, and they handle the distribution of La Roux, Robyn, Ellie Goulding, and bizarrely Marianas Trench in the United States (Marianas Trench should really be on Fuelled By Ramen by now). They also gathered considerable fame for putting out Lady Gaga's first two albums, The Fame and The Fame Monster. They pride themselves as being a label for up-and-coming artists and for promoting what they call 'alternative pop'. Okay, noble goals to be sure, and I can get behind that, particularly if they're promoting a more baroque or riskier style in their pop music. The problem with Cherrytree Records is that their producers are seldom ever up to the task of matching their artists' creative ambitions, which can lead to glossy instrumentation that approaches interesting material, but lacks the skills behind the production board to truly elevate it beyond shallow, occasionally disposable pop music (obviously there are exceptions to every rule). And when your artists have no desire but to make the shallowest and most vacant of material, or they lack the talent to make anything greater (looking at you, LMFAO and Far East Movement), you end up with a label with a reputation for superficial flash but little underneath. Well, she's pretty good but if I'm looking for the classic example of an artist who is handicapped by the production weaknesses of her label, Natalia Kills would be a prime example. She has a pretty good voice and some interesting lyrics that actually put a bit of meat in her claims to be inspired by Kate Bush, but her attempts at a gothic darkwave sound on that album fall flat no matter how hard she tries, mostly because the sound feels distinctly derivative of and/or sampled from older darkwave and industrial acts like Sisters of Mercy, Depeche Mode, and especially Nine Inch Nails with a hint of the same gloss Lady Gaga's material was splashed with on The Fame Monster. I have the feeling that if Natalia Kills were given the producers behind Charli XCX's True Romance, she might have a better chance of realizing her vision - but at the same time, the other unfortunate thing she shares in common with Charli XCX is self-obsession. Natalia Kills has said she's a perfectionist and the album revolves around said desires, but at the end of the day, most of those desires appear to be for wealth and fame (with love discarded by the wayside), and none of it is made to sound all that exciting or attractive or all that interesting. Yeah, she's a good lyricist and she's got some interesting ideas where to take said lyrics (some which raised serious questions, 'Acid Annie' in particular), but she hasn't quite sold me on why I should really care one way or the other. Now all of that being said, she's a much better lyricist that I expected and occasionally had a few songs ('Not In Love' and especially 'Broke' stood out for me on Perfectionist) that I found genuinely engaging, so there's definitely potential here if pointed in the right direction. So, on that note, does Natalia Kills manage to make me care on her reportedly darker follow-up, Trouble? Normally, darker sophomore albums are the death knell of young artists' careers, but given that Natalia Kills was already heading in a darker direction, will she break the cycle? Well, I wouldn't precisely call this album darker, but it sure is rougher, filled with a lot more guitars and industrial effects, almost completely eschewing the gothic edges of her debut. And while I will say that Natalia Kills' album Trouble is quite good, maybe even great, to me there is an element missing that undercuts this album significantly for me. That being said, if you're a member of the teenage girl demographic to whom this album is marketed, you're probably going to love it and relate to it, both strengths and weaknesses. Let me start with the elements that I think that 'work', for better or for worse. For one, when Natalia Kills is singing, she does a fairly good job selling emotional delivery, and while she isn't a fantastic vocalist by any stretch of the mind, the material feels like it comes from a real place. And while sometimes I feel she slightly oversells her vulnerability (which has had some critics calling it an act, which I don't buy), the broader strokes of those sorts of emotion can really work on a pop record, and I'll argue on Trouble they work more often than they don't. And while I won't say the production is particularly good - the guitar production can be a little too flat for my tastes on some tracks - there are enough elements that work to really stand out. The beats are heavy and pulsing and very danceable, the drum breakdowns are well-placed, and while I definitely think the pacing of the record could definitely be better, there's a lot of energy here that Natalia Kills reasonably matches (for the most part - I really wish they could have pulled back on the vocal effects a little and let her natural voice through more often). I do wish that the synthetic elements were toned back a little bit in favour of more organic texture, but that's a pet peeve and I can appreciate that Natalia Kills wasn't precisely going for that (although if she was and Cherrytree couldn't deliver... well, let's just say I wouldn't be surprised). And I have to admit, there were plenty of times (particularly during 'Daddy's Girl', which starts with a great Hall & Oates sample of 'Rich Girl', one of my favourite songs from that decade) that I really found myself liking her work more than I expected. And then it popped into my head and I found myself muttering it aloud, "Well, I'm glad someone decided to follow the lead of Ke$ha's Warrior." For those of you who didn't bother to take a look at Ke$ha's second album from late last year (and really, you should have), it was very much an album that was looking to fuse Ke$ha's electropop style with harder rock music, and she recruited Iggy Pop, Nate Ruess of fun., Julian Casablancas of The Strokes, The Flaming Lips, Ben Folds, and Patrick Carney of The Black Keys to get there (it's a damn shame her promoters have no idea to market that, instead releasing 'Crazy Kids' with that goddamn terrible will.i.am verse - seriously, who asked for that?). So why on earth can't I find Natalia Kills' Trouble as compelling or interesting as Ke$ha's Warrior? Because I want to, I really do, and as a fan of this kind of pop music, I really wanted to love the hell out of Trouble. But the sad part is that the answers are all too simple: lyrical content, framing, and mood. Let me begin by saying that I think Natalia Kills is a more interesting lyricist than Ke$ha - her verses are more complex, her rhymes are generally more intricate, and there's more wordplay on display there than you typically see in most pop albums. And Natalia Kills is definitely as blissfully raunchy as Ke$ha (if not more so), so there's no issues there. The difference here is the choice of 'role': Ke$ha, due to the fact that she's smart and weird and kind of eccentric, tends to speak more in her lyrics to the 'outcasts' and the 'crazy kids' and those living on the edge (something her fanbase of Animals have embraced wholeheartedly). Natalia Kills, on the other hand, seems to be going for the popular crowd, with lyrics that seem to focus more on fashion and image and opulence and glamour, which can make her attempts to play the outcast card and ask for sympathy a little less credible. And while both of their music can sound just as synthetic, Ke$ha's choice of subject matter tends to add more texture and flavour and feel more organic, while Natalia Kills' material is a little glassier and a little slicker. Now, this isn't usually a problem, and to her credit, Natalia Kills does do a better job making said themes sound attractive to the audience, and while she isn't nearly as populist as Ke$ha, she's getting better at having a wider focus beyond herself - but this leads to my second problem, which is in framing, which I talked about extensively in my review of The National's new album. For starters, Natalia Kills delves into some pretty dark subject matter throughout her lyrics, and I'll give her credit for occasionally framing the situations with a fair amount of nuance - but there are also noticeable points where her lyrics paint a dark picture and the framing is used to glamorize said picture. The biggest example of this in my mind is 'Controversy', a song that sprays forth a whole slew of very real problems facing our generation - and then bookends the song with classy, opulent samples that suggest said controversies might actually be attractive to our listeners, something they might want to consider if they want to be famous and popular and wealthy (which is clearly framed on this album as the ideal, particularly on tracks like 'Daddy's Girl'). And the thing is, lyrically there are several points where Natalia Kills paints herself as the bad girl and the damaged one - but yet too often the songs are framed to celebrate that attitude, and without that added texture and mood Ke$ha brought to the table, it doesn't quite feel as 'real' to me, even if it is very real for her or for her audience (as I suspect it is). And here's the clinching, final piece: the mood of the tracks. Whenever Ke$ha brought emotion to the forefront on Warrior, there was always additional context presented in her delivery and execution, giving the songs some real nuance that pop music lacks. She might have been angry on 'Thinking Of You', but it was tempted with reflexive contemplation. 'C'Mon' and 'All That Matters (The Beautiful Life)' were songs seeking the party, but there was desperation in those tracks that made me feel real empathy for Ke$ha in her songs. But with Natalia Kills, we don't always get that added subtext, which the more intricate lyrics require and isn't always supported in the vocal delivery or instrumentation. Sure, we get it on the songs where it is quintessential for the song to work at all ('Television', 'Devils Don't Fly', 'Watching You', 'Marlboro Lights'), but elsewhere, it's not quite there in the way it needed to be. Furthermore, for as much energy that this album had, I do think that the quieter moments could have been given a little more emphasis, if only to enhance the juxtaposition with the louder, more energetic tracks. This could have given Natalia Kills more of a chance to show emotional complexity in the vocals, and more often than not, I found myself wishing for more of it, both on the louder and quieter tracks. 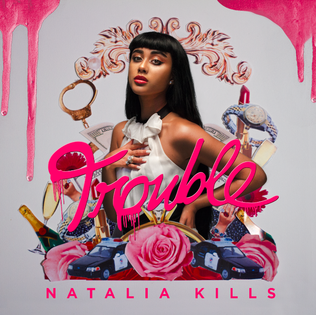 But even with all of my issues with Natalia Kills' Trouble, I'm still going to recommend it for you all here today. It's definitely stronger than her first album with a well-executed stylistic shift towards electro-rock, and I'd argue for the most part, she pulls it off. Her fans and her audience are probably going to love it, and there definitely is enough interesting, well-structured lyrics to appeal... but at the same time, I think it could have been a little better, and it didn't quite completely click with me. She wanted to go for real rock and punk, and yet I feel the album is a little closer to 'party rock', if you catch my drift. That being said, it's pretty damn good party rock, and if you can tune yourself to the right mindset, I bet you'll find yourself enjoying the hell out of Trouble by Natalia Kills. And if you're looking for another reason not to prejudge a label, this album is a good place to start.